Some don’t just want a pair of headphones that sound great, but also want a pair of cans on their head that are a statement in design too. Well, the Urbanears Zinken on-ear headphones aren’t afraid of being bold, they want others to see them. This presence is created by the materials used to construct the Zinken headphones, which aren’t outrageously different in design to most headphones, but their rubberised finishes are. The cups and headband are covered in plastics and the hinges are metal; they’ve stood up to our incessant usage, but we did notice some discolouration appear on the ear cups. What makes them look bold is the chunky headband, circular ear cups and the somewhat obtuse colour choices used to show off the rubberised plastics. The tomato red pair that we have is definitely the most courageous of the ten colours and we dig them for it. The Zinkens are nice in that they're not massive nor are they a petite pair of headphones; but they do stay on the head when walking around and also remained in place when running and longboarding. Plus their generous padding and tight design keep the world's noise out of your ears starting at 60-65% volume. The cups can be folded into the headband and in this form we managed to pop them away in a coat pocket with no trouble. Urbanears talk a lot about this pair of headphones being great for DJs, and one reason they believe this is because the ear cups swivel, so each can be heard independently. DJs also usually work long stretches so they have to be comfortable to wear for a good three hours plus and we’d give them a thumbs up for comfort, the padding is very soft. 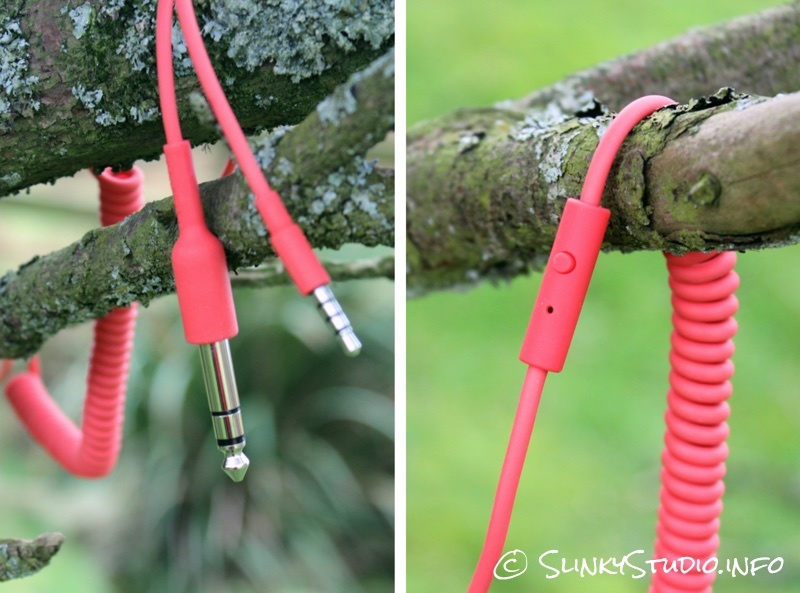 The Urbanears Zinken headphones have both a 6.3mm and 3.5mm jack input; so the supplied cable can be connected to your smartphone and when flipped around can be used with hi-fi and DJ equipment. The cable is coiled, which is something we don’t see so frequently nowadays on headphones, and when pulled out and combined with the straight sections, it comes to 5ft. A microphone of average quality and single button remote control feature on the cable, enabling the control of music playing and other functions of iOS devices. Looks and function aside, audio quality is of a standard to serve reasonably good output of the low frequency ranges, but we really didn't feel anything about the sound signature was outstanding: they're good but are not pulling any masterstrokes for their price. Yes, the bass has a credible degree of depth for an on-ear pair of headphones, the treble isn’t hidden away, but the high frequencies are too often lost, which really lends these to genres of music like dubstep and heavily electronic tracks (we listened to ‘Nuclear’ by ‘Zomboy’ and it sounded great, with lots of dirty synth bass); hence the DJ attributes. When we then listen to more everyday pop music like ‘Lips Are Movin’ by ‘Meghan Trainer’, the performance is fine, but if we listen to an acoustic track like ‘You Can Rely On Me’ by ‘Jason Mraz’, the level of clarity is hazy. Jason’s voice isn’t prominently in the foreground and the instruments are slightly unclean sounding too, and the weak highs and narrow sound stage don't assist this at all. If we put the Urbanears Zinken head to head against the Marshall Major FX headphones which we’ve already previously reviewed, both of which are priced at around the £100/$129 price mark, the Zinkens lack in the overall body of sound when the frequencies are combined, not specifically in any one particular frequency area either. At the end of the day it comes to what you value more, design or performance. The Urbanears Zinken headphones are a fashion accessory first and foremost, with satisfactory performance in the audio playback department. But if you’re willing to skip the colours and bold design, better value options like the Marshall Major FX headphones would be our choice.